The Practice Resource Institute is the law office and law practice management service of The Florida Bar. For assistance, contact the Bar’s Practice Resource Institute to speak with a practice management advisor. PRI can be reached from 8 a.m. to 5:30 p.m., Monday through Friday, via phone at 866-730-2020, email at ‪[email protected], or live chat via the PRI website at ‪http://pri.floridabar.org. 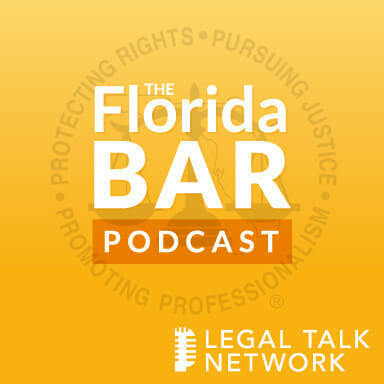 Christine Bilbrey: Hello and welcome to The Florida Bar Podcast brought to you by the Practice Resource Institute on Legal Talk Network, and we are so glad you are joining us today. This is Christine Bilbrey and I am a Practice Management Advisor at PRI and I am one of the hosts for today’s show, which is being recorded from our offices in Tallahassee, Florida. My co-host is Jonathon Israel, Director of the Practice Resource Institute. Jonathon Israel: Hello. I am Jonathon Israel and as Christine said, I am the Director of the Practice Resource Institute here at the Florida Bar. Our goal at PRI is to assist Florida attorneys with running the business side of their law practices. We will be focusing on a different aspect of technology each month and will carry that theme through our website and newsletter with related tech tips and articles. Joining us now is a special guest, who is an expert on today’s topic, E-Filing, and we want to welcome Dario Diaz to the show. Dario is the Owner and Managing Partner of the Law Office of Dario Diaz, P.A. in Tampa, Florida. In 2014, Dario was named to the Florida Bar Standing Committee on Technology and now stands as the Vice Chair of that Committee. He is also the President of Legal Automation Systems, Inc. His company has created a software that interfaces with the court systems and files court pleadings electronically. Christine Bilbrey: Welcome to the show Dario. Dario Diaz: Thank you. Thank you for having me. Christine Bilbrey: We are really glad you are here. So we are going to ask you to tell our listeners a little bit about the history of E-Filing, how it all came about, and what your focus is on E-Filing. I am going to give you a little pre-plug, because we are excited about our new Member Benefit that’s coming up, which is actually a product that your company created called eFileMadeEasy and that should be available soon and maybe with a discount sometimes for our members. Dario Diaz: It sure will be. And basically thank you for the opportunity to be here. And yes, the eFileMadeEasy program allows people to e-file with just a click of a mouse button right out of work. But the real goal here today is, let’s talk about E-Filing itself. You gave me a chance to talk about the history of E-Filing, and I will be very brief with that. Back in the old days we used to send paper to the court. You used to print your paper on the printer, assemble it, staple the top left-hand corner, have somebody take it to the courthouse or send it by mail, and they would two-hole punch it and add it to the court file and paper down at the courthouse. And that was all great. Around 2013 though, Florida introduced E-Filing and they changed that to be able to send the document electronically, directly to the clerk — well, not directly to the clerk, but through the E-Portal to the clerk. And ever since then it has been a growing, changing, very dynamic environment, the struggles dealing with how to e-file, the right way to e-file and how we get this information to the clerk. So that’s briefly where E-Filing comes from. So I think every lawyer that’s listening now, hopefully anybody that files with the court is at least familiar with E-Filing or has seen the portal at some point or another. Jonathon Israel: Definitely. And I think an important point that you made there is that it’s a system that’s constantly in development. We always hear about attorneys complaining about the E-Filing portal, but it’s still very much in its infancy and getting better everyday. The more people use it, the more input the E-Filing portal authority gets from those users. Dario Diaz: Yeah. And to add to that, even more so Florida is really on the cutting edge of being a groundbreaker. So when you say we are getting some feedback and things may not be right, well, kind of the saying that the people at the front take the arrows, those are the guys that are breaking ground, and Florida is doing that. They are doing a very good job at it. Obviously there’s some deficiencies, but as they get feedback, it gets better. Other states are not even — they are not even close to where Florida is right now. Jonathon Israel: And I think Dario, some of the pain points that we hear from attorneys is not really understanding the system and maybe some of the standards that they need to follow when they are filing through it. Can you give us maybe a rundown of what some of those might be or maybe give them some guidance on where to find those? Dario Diaz: Sure. I have been a managing partner since 1999 and there’s something that I have learned about lawyers and that is, generally speaking, we are not the most tech-savvy people around. And I get it, everybody is busy, you have got a lot of work to do, your practice is busy, you don’t have a chance to really learn what type of PDF you want to submit to the portal. It’s sort of a let’s get it done. It’s not something that a lawyer wants to focus on. But briefly, when you are preparing your file there are a couple of critical things that you want to deal with right off the bat. The first thing is you want to make sure that your file is a PDF. I know that the portal will accept DOC and DOCX files. I strongly advise everyone hearing this or anybody filing with E-Portal, don’t submit DOCX and DOC files. It’s not a good practice. The file is filled with stuff you don’t want other people having. And obviously the portal is subject to public disclosure laws, to records keeping and records retention and giving them your raw file is not particularly advisable. So let’s focus on the PDF standard. Before you submit your files to the portal, make them a PDF. Now, this is where you get a lot of attorneys that don’t really understand the difference between a good PDF and a not good PDF. If you print your document and you scan it into a scanner, it’s a bad PDF. Nobody likes it. The portal doesn’t like it, the clerks don’t like it, the ADA doesn’t like it, it violates all the rules. Your documents that you submit to the E-Portal must be text searchable. That means that if you create your PDF directly out of Word or WordPerfect you are fine. But if you are printing your document and rescanning it and sending it to the E-Portal, you are not in compliance, don’t do that. You are wasting time, you are wasting resources, you are wasting space, and nobody likes you for doing it, so don’t do it. Christine Bilbrey: I was just going to ask, the other hot topic on this area is metadata, the buzzword metadata that terrifies people. So can you tell our listeners where that shows up in this whole process? Dario Diaz: Sure. Metadata is — think about metadata, for those of us that are old enough to remember, the Dewey Decimal at the library, it’s data about data. It’s something that helps you find or define something else. So when you make your pleading a PDF, you are providing yourself some production. And one of the things I ask people to do is search. Get on Google and search for Yo-Yo Brain Judge. When you do that you are going to find a case of an attorney that typed in, this is a Yo-Yo Brain Judge, and then took it out, but it was funny, and they submitted the document. Well, in the metadata that remains, because metadata is what the document carries along with it. Well, the judge found out, and obviously when you call a judge a Yo-Yo Brain Judge, it doesn’t bode well for you and your case. So scrubbing metadata is not a particularly easy thing to do. There are manual steps to it and there is some software out there that does it, but metadata is a concern and you can scrub it from a program like Acrobat Pro, which is not the free version of Adobe Reader that everybody just downloads for free. It’s actually the version you have to purchase. But careful with metadata because you may be sending people stuff you don’t want them to have. So that is an issue, and lawyers are responsible for that. And to be very honest with you, in our business a lot of people, even though they are not supposed to look for it, people look for an upper hand, and you can’t underestimate the fact that your opponent is going to search for metadata to see certain things that you may not want them to know about your computer, about where it was created, about how it was created, do you use a third party to create your documents, those are the kinds of things that you want to try to avoid and scrubbing that metadata is a big plus. Christine Bilbrey: Great. Thank you. My next question is about, I have correctly created my PDF, I have scrubbed my metadata and I have loaded it up into the portal, is my pleading filed with the court now? Dario Diaz: No, your file, the pleading that you send up, that PDF is actually taken to the E-Portal. Think of the E-Portal, this is the best way I can describe it, think of the E-Portal like a mail room. Every clerk has his own individual mailbox. What you are doing is you are taking your letter and you are putting that letter on the floor of the mail room. The E-Portal then gets that letter and picks it up, looks at the box and the wants and says, okay, this is a Hillsborough County case. I am going to put that in Hillsborough County. That’s really all the E-Portal does. Obviously it does a lot more than that and I am simplifying things, but you get the idea. The E-Portal is a conduit, a delivery method to get your pleading to the county that you are filing that pleading in. Once it’s there it’s up to the clerk to actually do the processing, the verifying, making sure your case number is the right case number, making sure the case names match up, and it’s up to the clerk to file it and actually validate that filing. So the E-Portal itself is basically a method to get your pleading to your clerk of the county you are filing the court in, and I think that’s a little bit misunderstood too, because I see a lot of people get frustrated with E-Portal when the E-Portal is really not the one rejecting your pleading because you scanned it in color. A lot of counties are now rejecting color pleadings and they should, they are huge, they take up 10 times the space of a black-and-white, and a lot of people just scan it in color. Well, that’s not the E-Portal fault, the E-Portal is just going to give that document to the clerk, that clerk may reject it because it’s a color scan. So that’s sort of how the procedure works. Jonathon Israel: Right! I think that’s another very important point for our listeners out there is that there is standards for the e-filing portal but then each clerk also has their standards of how they want the documents submitted to their system. So it’s very important for listeners that whatever county or circuit they are in, they check with the appropriate clerk to see how those documents should be formatted before they submit to the portal. Dario Diaz: Yeah, absolutely! And as a general rule I can tell you what no clerk will reject, and here we go, I will give you sort of a list, and if somebody wants to grab a pen and start writing stuff down. Great! Number one, set your scanner to black-and-white. If you have to scan your doc — I am suggesting nobody scan their pleadings by the way. I am suggesting that everybody provide their pleadings in a searchable PDF format made directly from your Word Processor. But if you have to scan, scan your documents and set your scanner to black-and-white. Set it to 8.5×11, the size of the document matters. The portal requires 8.5×11 inch pleadings. Set your scanner to 300 dpi, that’s 300 Dots Per Inch, that’s the standard used by the E-Portal for clarity, quality and their size restriction; and make sure that your pleadings themselves are what’s called PDF Compliant, that they are actual PDF documents. Don’t try to send them as a JPEG or a TIFF or something like that, make sure that they are PDFs. If you do that you’re going to be safe, and everybody is going to like you. If you submit scanned pleadings, not so much, but if you stick to those standards, you should be fine. Christine Bilbrey: And is it still a case that there are actually three different portals used in the State of Florida. I looked it up and it looked like the Supreme Court and the second DCA has one that is used by most circuit courts and county courts, but then the other DCA’s and the Federal system have two other completely different portals? Dario Diaz: Yeah. Florida, one of the issues that they have had is they put a lot of time, effort and energy into a program before the E-Portal called eDCA, and a lot of the districts use that. Everybody is supposed to be coming over the E-Portal, but another thing we learned about lawyers is we are sort of resistant to change. I mean, I think if you give lawyers a chance to go back to a scribe with a pen and quill, they love that, but you have a situation where they put a lot of resources into that eDCA. So every Appellate Court except the Second DCA is still using that DCA method. The Florida Supreme Court and the Second DCA is using the E-Portal, the one that we know regularly, and then of course, as you mentioned the Federal system is still on their PACER or the CM/ECF. So while all of Florida should be going to the E-Portal, and getting away from the eDCA standard, it’s been a little slow coming. Jonathon Israel: Dario, going back to the document creation steps and all that, we have talked a little bit about the metadata and making sure you create the document in your Word Processor first and then creating the PDF from there, is there some quick steps you could give our users or listeners on how they would remove the metadata when creating the PDF out of like a Word? Dario Diaz: Yeah. Doing it out of Word there is actually a process that you can use and it’s the Inspect Document Process. So if you have a pleading, and I will sort of try to walk you through and see if you can get this. I will use Word as the example. So under Word, if you were to go to the Word main menu item, the Word button, there is an item under there called Prepare, under the main button, the main Home button for Word. If you go to Prepare you’re going to get a secondary menu and one of the items going to be Inspect Document. Under that Inspect Document it’s going to give you a list of things that your document has in it, things like comments, redlines, watermarks you may have added, hidden text you may have added. In other words, it’s going to show you all of the items in the document that can be metadata. When you inspect that document it’s going to give you an option to remove it. So if you were to use this Inspect option it will give you an option, do you want to remove comments and revisions? Do you want to remove the document properties, and you can remove from there. Once you scrub your document of that metadata from that Inspect properties, at that point you can go directly to save it as a PDF. Don’t print it and scan it in your scanner, stop doing that, you’re making everybody mad and nobody likes you. So print it directly from Word, print it from Word Perfect to a PDF and then use that PDF to send to the E-Portal. Jonathon Israel: All right, awesome. Thanks Dario. Another question I have for you is, so if I do have something I need to scan, say it’s an image or something of that nature that I can’t obviously create in Word or another Word Processor program and I do scan it at 300 dpi, those images start to take up quite a bit of space and I know the e-filing portal has certain requirements on the amount of the size of the document you could submit to them. What tips or suggestions do you have for our users to get around some of those limitations? Dario Diaz: Okay. The E-Portal will accept pleadings up to 50 megabytes, so that means you can scan document size up to 50 megabytes and file them with E-Portal without issue. If you go over 50 megabytes, there are different methods you may have to put it on a CD or a thumb drive and actually take it to your clerk’s office, but, 50 megabytes is enormous. The number of people listen to this podcast that are going to have more than 50 megabyte files done correctly is going to be tiny. Now, if I start scanning pleadings in color and I start adding — very important to mention this, just because a document looks black-and-white to your eye does not mean it’s black and white. If your scanner is scanning in color, if you scan a black-and-white document into it, it’s still bringing that entire color palette with it. So it’s enormous, it’s probably 10 times the size it should be. So even if it looks black-and-white to your eye, don’t think that it’s a black-and-white document. So when you scan your pleadings, scan them as black-and-white. When you’re actually preparing your pleadings, there is an option available in almost every PDF, whether it’s Adobe Reader, Adobe Pro, Acrobat Pro, whatever it is, that has smallest file size. So let’s say you have an enormous document. Open it with your PDF Reader and then Save As and use your Properties button, and Save As smallest file size. What that’s going to do is it’s going to take that PDF document and it’s going to take out a bunch of the stuff you don’t need. So let’s say you’re making it compatible and you want to go back to Adobe 2.0, which is 15 years ago. You don’t need all that stuff, you can just make it compatible for Adobe, maybe 9 and above, well, that will really shrink your file size. So by using that smallest file size, you’re going to be able to really compress that PDF file to be something that everybody is going to accept and everybody is going to like and it’s going to save you a lot of hassle and misery. Christine Bilbrey: Great. I’m curious so we’re talking about submitting documents. So I’m curious about what else the portal does. Can an attorney receive documents through the portal, can they send proposed orders through the portal, is it more than one way? Dario Diaz: Yeah, the answer is, yeah, maybe, and that’s a real lawyer answers, I’m sorry to not answer yes or no. Yes, the E-Portal wants to take, for example, they really want to do that, but it’s so hard for them. Think about this for a minute. The E-Portal is dealing with 67 different elected officials, out of 67 Florida Counties. Every one of those 67 officials is elected and they do kind of their own thing. They all have egos, they all have ideas, they all have things that they want to implement, things they don’t want to implement. And the E-Portal is trying to make everybody happy. Within that 67 counties, how many judges do you have? Each one of them, an elected official, each one of them with a way they like to do things, each one of them with their own ego, all that stuff plays in. So you may have Judge Millennial that wants to do everything digital, that wants to get it over the E-Portal, that wants to get that order, that wants to sign it electronically, that wants to email it back, and then you may have judge, trying to think of something nice, Judge Premillennial, Judge Boomer, okay? We’ll use Judge Boomer. You may have Judge Boomer that absolutely refuses to do anything but sign with his inkwell and quill and the portal is trying to adapt to this, and that’s not an easy thing to do. So some counties are taking orders right now, proposed orders, most are not. It’s very few and very selective. I think that’s going to be a real battle for the E-Portal authority to deal with, but you can submit some orders to some judges but overwhelmingly not right now. Christine Bilbrey: Okay. And Jonathon found this great site. It’s actually a service that the Florida State Law School has put up and it lists all 67 counties, because just like you said, there are a lot of differences of how they are handling the portal. So I am from Pensacola, I clicked on Escambia County and the very first thing that came up was, as of this date in 2015, we are no longer accepting proposed orders. So they were and now they are not. So Jonathon, is that a link that we can put up on our site? Jonathon Israel: It is, yeah, we will definitely get that up and out to the users. Dario Diaz: Let me address that as well. Actually, the Escambia County clerk was very kind, they actually called me based on my — I guess my company and what they have heard about what we can do. The real reason, the problem they had was this, and this sort of gives you an idea what the E-Portal has to deal with. Their judges were signing orders and they needed to send those orders back out. But they had no way to get those email addresses for all their people. So their JAs, their Judicial Assistants were having to log into the E-Portal every time, put in the case number, get the case number, match the case, and then pull the email addresses from the E-Portal and bring them back manually into their Outlook to be able to serve their order back. I mean, you can imagine the labor involved with that, the time, effort and energy. They called us and we wrote a little tool for them to be able to get the email addresses, which they were very appreciative of, because now they just basically searched the case and with our little tool that we wrote for them with my company they are able to get the email addresses now without real issue. But before that they stopped accepting orders because it was overwhelming them. I mean, you can imagine how long it would take to prepare 10 orders if you had to do it that way. Christine Bilbrey: Yeah, absolutely. So it’s creating more work instead of reducing it. So you touched on that, so tell our listeners, the new Member Benefit that we have coming up, what does this piece of software do for you? If I am having to file a lot of things through E-Filing in the portal, what can I expect to gain by getting the software implemented? Dario Diaz: Sure. Well, what we do is we work directly with our clients to come up with a method that works and fits for them. The thing about the E-Portal is — and it’s necessary, they have to be rigid, they have to have standards, because you have 67 counties and 100,000 lawyers and they have to have these standards. Well, as a company I can adjust and adapt to my client in order to provide that to the E-Portal in that that fixed way. So, basically what we have done with eFileMadeEasy is we created a basic click out of Word that e-files and e-serves your documents and as a result along the way we have created a system where our clients can bulk prepare their pleadings, they can get their pleadings on their end and let’s say they have a 100 different things they want to file that day, they can prepare them and send that entire 100 to us at one time. We will then take those and we will file them with the E-Portal for them directly. So it takes a process that might take somebody quite an amount of time to prepare on their end, and I have cut it down to just basically a minute or — not even a couple of minutes. If you are filing a pleading, with a button click you have e-filed and e-served your document in about 3 seconds with our service. But the idea is that we can create that conduit to make it clean, with all your pleadings perfectly, our software cleans out the metadata automatically. All that’s done for you. It’s all prepared correctly. Everything is made to standards and everything is submitted directly to the E-Portal the way that they like it. And that’s sort of what I have done is, I have facilitated all those steps of having to prepare the documents. Jonathon Israel: That’s great. And I have seen it in person, so I know that it’s going to be a great service to our members once it’s out there and available for them. Dario Diaz: Yeah, we are excited about it. Obviously the process, so becoming a Member Benefits took over a year and that committee, all those guys were mean. I mean, they are just mean people. Wow, they really — I can tell you this, I will tell you this after going through and after taking my bites, they really look after the Florida Bar members. They are not going to let anything make it through that’s not well vetted. Those guys are — they are tough guys. So kudos to them. I wish they would have been nicer to me, but I am glad they did what they did. Christine Bilbrey: That’s true. Our first concern are our members, we really do want to bring them the best products. Dario Diaz: They make sure of that, I can tell you that personally. They make sure of that and I have got the scrap marks to show it. Christine Bilbrey: Well, we are still grateful that you persevered through it and so we are excited that that’s going to be available. And it looks like we have reached the end of our program and I want to thank Dario Diaz for joining us today. Dario Diaz: Thank you for having me. My pleasure. Christine Bilbrey: So if our listeners have more questions for you or they want to follow up, how can they reach you Dario? Dario Diaz: They can reach me through my website at HYPERLINK “http://www.efilemadeeasy.com” efilemadeeasy.com. They can reach me at my law office. I am listed with the Bar Registry, they are welcome to look me up, it’s Dario Diaz, and I always hold a hand out. I extend a hand to help anybody that might need it. They can call me personally and I will speak with them on any of this. It’s part of the commitment I have made to the Florida Bar Committee that I am on. Christine Bilbery: That’s wonderful. Thank you so much. This has been another edition of the Florida Bar Podcast brought to you by the Practice Resource Institute on Legal Talk Network. The Practice Resource Institute is the law office and law practice management service of the Florida Bar. For assistance please contact the Florida Bar’s Practice Resource Institute to speak with a practice management advisor. PRI can be reached from 8 a.m. until 5:30 p.m. Monday through Friday. You can reach us by phone at 866-730-2020, email at HYPERLINK “mailto:[email protected]” [email protected] or you can live chat us via the PRI website at HYPERLINK “http://www.pri.floridabar.org” pri.floridabar.org. I am Christine Bilbrey. Jonathon Israel: And I am Jonathan Israel. Thank you for listening until next time. Thanks for listening to the official Florida Bar Podcast brought to you by The Florida Bar Practice Resource Institute and produced by the Broadcast Professionals at Legal Talk Network. Subscribe to the RSS feed on HYPERLINK “http://www.legaltalknetwork.com/”legaltalknetwork.com or in iTunes.